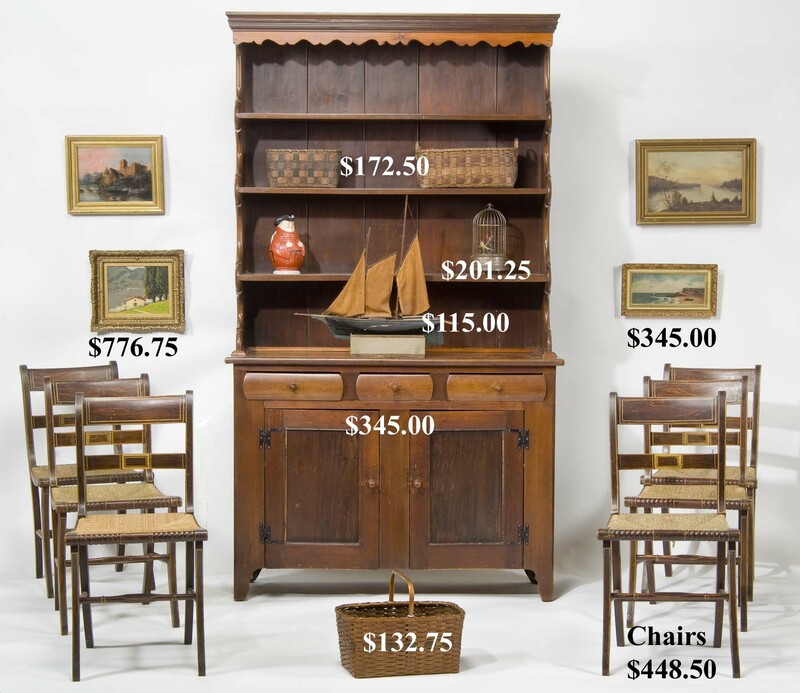 Offering a diverse selection of antiques and decorative accessories removed solely from estates, private collections and old households, including items from the York Harbor estate of Frances Wendell Stone Warrick and from the LeRoy, NY estate of Elinor Townsend, formerly of Kittery Point, ME. Preview by appointment is strongly suggested. EARLIER FURNITURE: 36 in. inlaid mahogany Boston secretary desk with Gothic arch glazed doors and figured maple paneled drawers, having descended through Boston’s Wheelwright family of merchant shippers and former owners of Rowe's Wharf. Pair Philadelphia Chippendale side chairs (See Sack’s Fine Points of Furniture, p. 46). 57 in. Sheraton mahogany deep drop-leaf one part dining table with spread-wing eagle and paterae inlay. Distinctive 87 in. New York acanthus-carved classical recamier on hairy talon feet. 47 in. 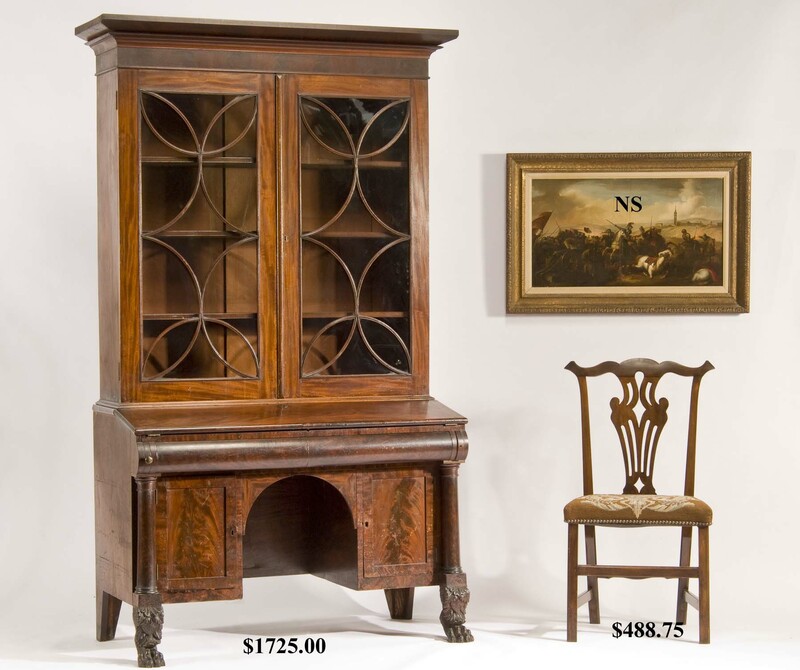 classical two part secretary desk on acanthus-carved talon feet. Early 19th c. NY card table on carved four-legged base with brass talon feet. 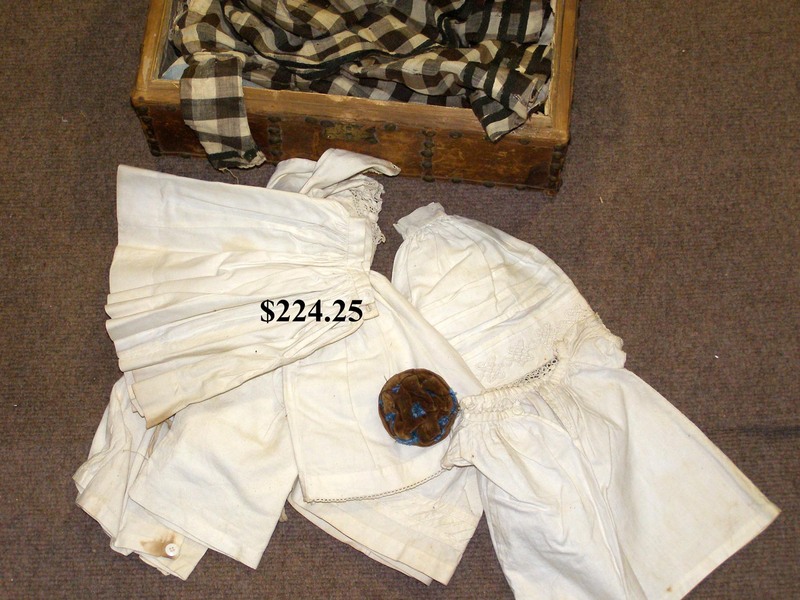 Mid-18th c. mid-molded two drawer blanket chest with shaped skirt. Early English 42 in. mahogany server with leaded bottle drawer. 36 in. oval maple tea table on turned legs. Several early slant lid desks in various woods. Good Pembroke tables. Early tavern and sawbuck tables. 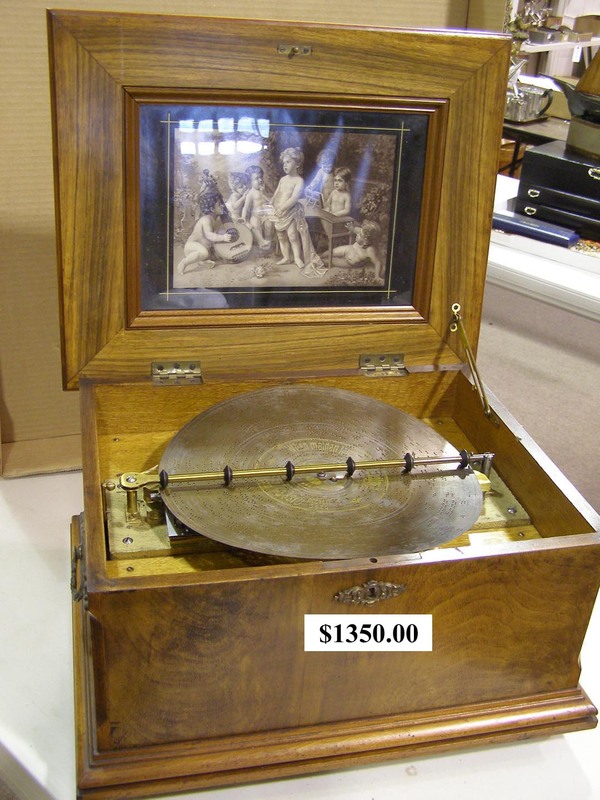 Several early tripod tipping tea tables. Numerous good candlestands and one and two drawer stands of differing description. 44 in. Sheraton figured birch four drawer chest with carved posts. Numerous early 19th c. mahogany, cherry and figured maple chests. 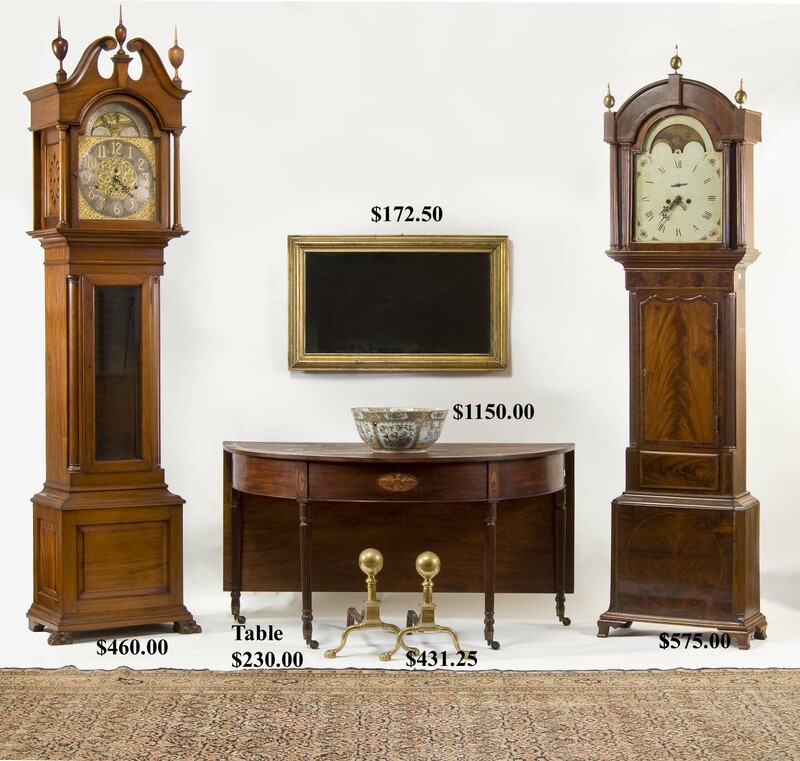 18th and 19th c. tall case clocks. N.E. Chippendale side chairs. Figured maple 19th c. canopy bed. Early 19th c. stepback open top pine cupboard over three drawers and cabinet base. Mid-19th c. pine corner cupboard. 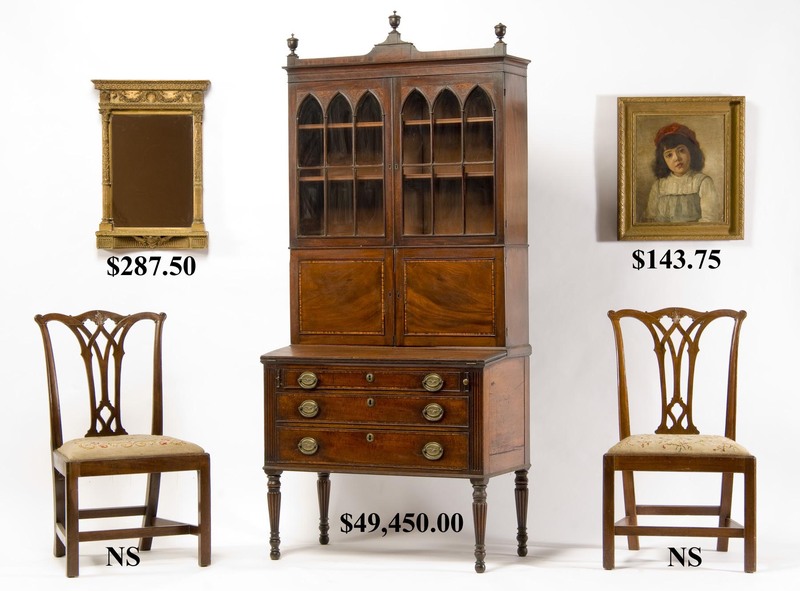 Sets of 19th c. figured maple, paint-decorated and bamboo-turned dining chairs. Fancy 22 in. square gaming table with sectional foldout top. 35 in. cherry and bird’s-eye maple dressing table with fancy splash. Camphor storage chest. Two section 19th c. mahogany tea chest with fitted pewter canisters. Blanket and storage boxes. Two pairs of rare standing 19th c. continental wrought iron torcheres with brass mounts. 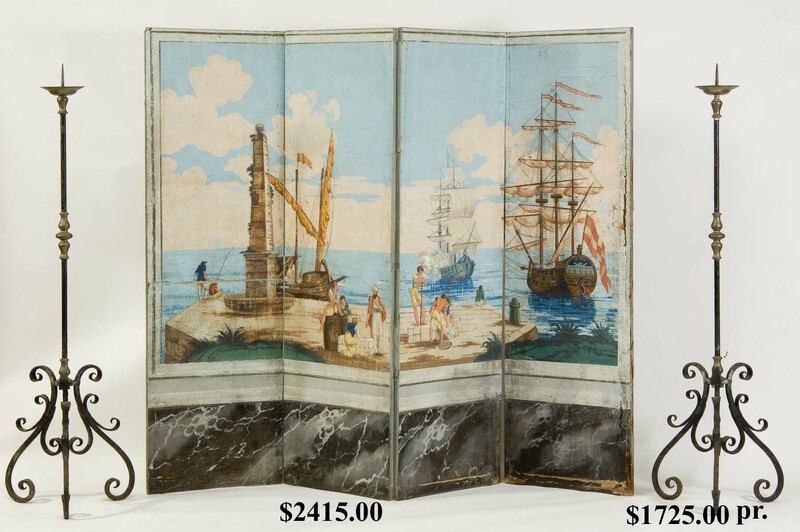 Colorful 19th c. four-part folding screen with coastal marine motif painted canvas panels with fishermen. Good rectangular giltwood and ogee mirrors. David Dutton NH split column shelf clock. VICTORIAN AND 20THC. FURNITURE: Symphonion rosewood-cased music box with fifteen 12 in. discs. Early 20th c. 72 in. inlaid bowfront mahogany sideboard with cuffed tapering legs. Five drawer mirrored oak tall chest with unusual shaped front. Leaded glass and other barrister bookcases. 42 in. rolltop oak desk. Stickley Craftsman youth chair. Good marble-top side tables. Interesting occasional tables in various woods. The best J. & P. Coats cherry six drawer spool chest with metallic labels and colorful back side advertising panel. Eastlake style Willimantic four drawer spool cabinet. Rare Moxie storage ice chest with graphic advertising. 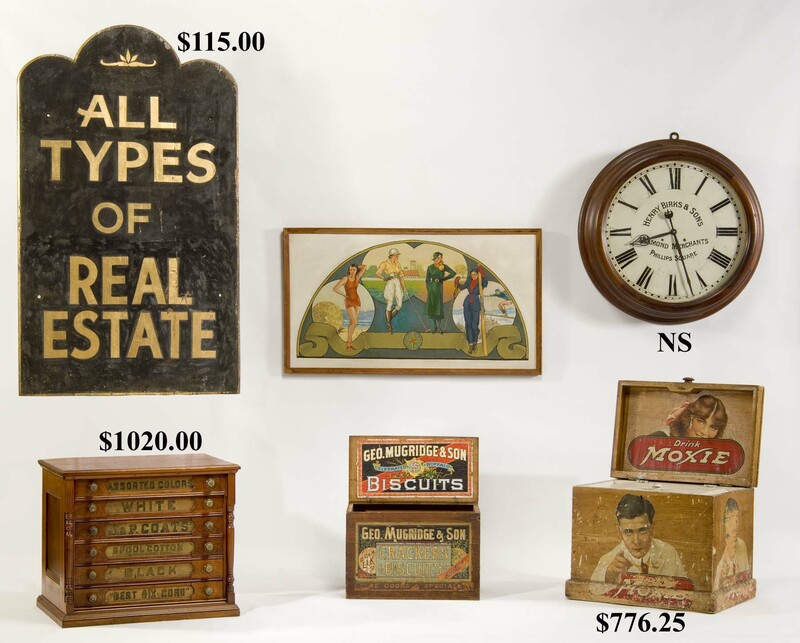 Early 20th c. giltwood real estate and other signs. ESTATE CHINA, POTTERY AND GLASSWARE: Rose Medallion, including 15 in. punch bowl. Scalloped Canton bowl and tableware. 12 ½ in. oval Fukagawa bowl. Imari chargers and bowls. Oriental motif table lamps. Abbey Ruins chamber set. Quimper. Dedham. Majolica. Seaweed batter bowl. Belleek. Royal Doulton and French figural pieces. Older Royal Family commem. china. Staffordshire figurines. Scheier, Niloak, Fulper and misc. art pottery. Decorated stoneware. 9 in. 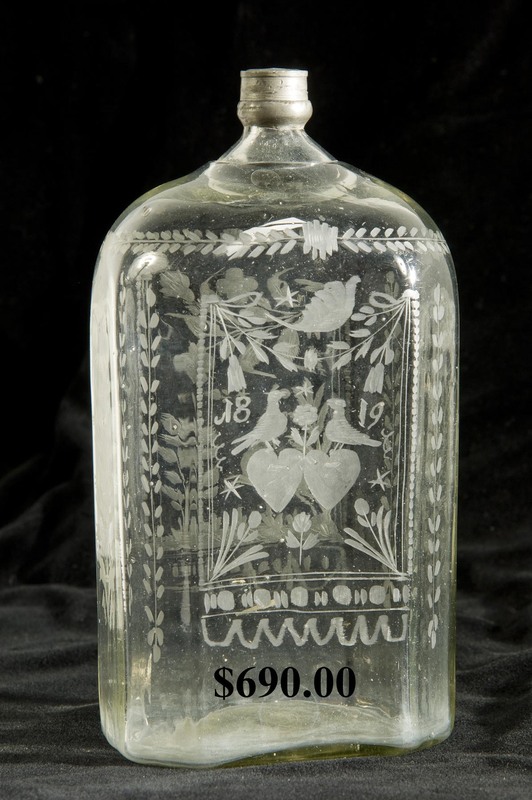 1819 etched Stiegel spirits bottle. Cranberry candle lustres. Clear Sandwich footed compote and celerys. Good decorated and etched 19th and 20th c. glass. CLOCKS: Rare 31 in. Seth Thomas 30 day “Arcade” gallery clock advertising Montreal diamond merchant, Birks & Sons. Tiffany gilt metal bracket clock by Japy Freres, France. Very fancy oriental figural gilt metal shelf clock. 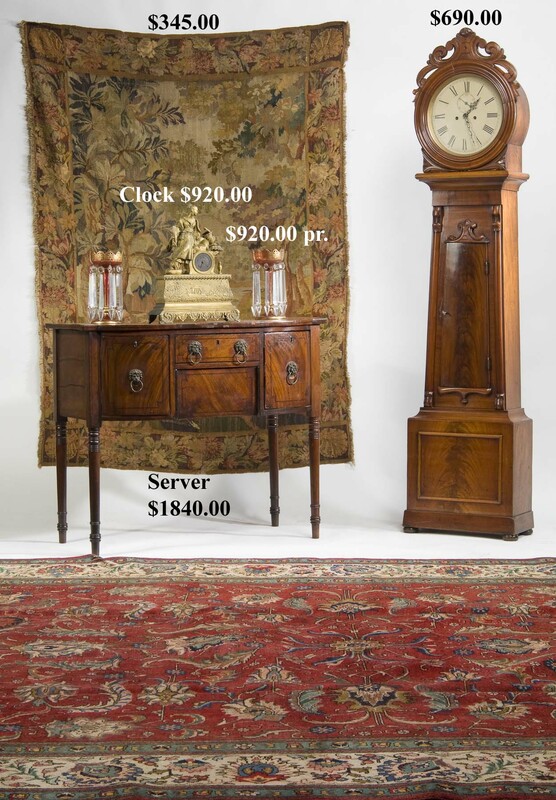 Boston-marked and French marble clocks. Other shelf clocks. RUGS, TEXTILES AND VINTAGE CLOTHING: Selection of large and small area oriental and other woven rugs. Graphic 19th c. quilts, coverlets and paisleys. 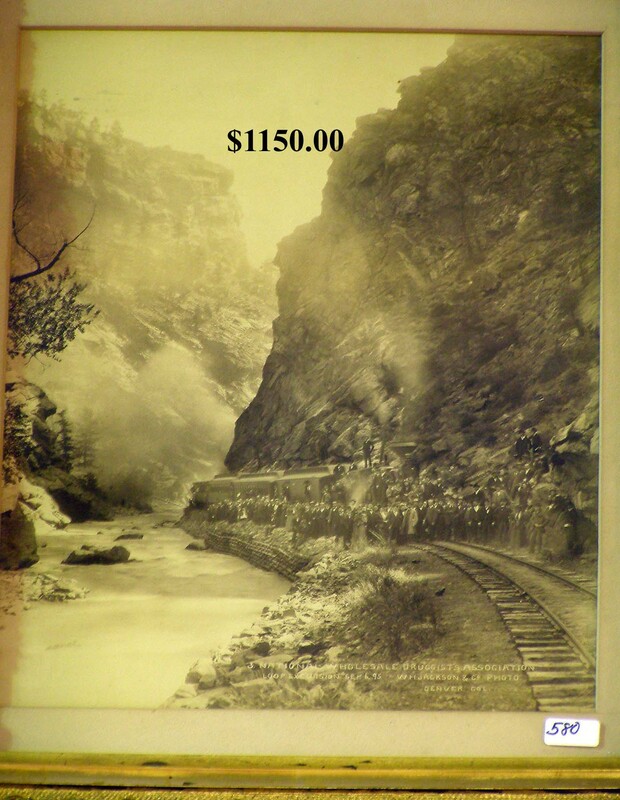 Early Continental scenic woven tapestry. Good linens. Mary Barrett Wendell’s beetle wing decorated satin dress (Detail 1, 2) (NYC, 1832-1912). Ladies’ and men’s hats. Span. Am. War uniform coat. Large selection of 19th and 20th c. gold, platinum, sterling and gemstone ESTATE AND COSTUME JEWELRY and gold pocket watches, all to be sold early in the sale. 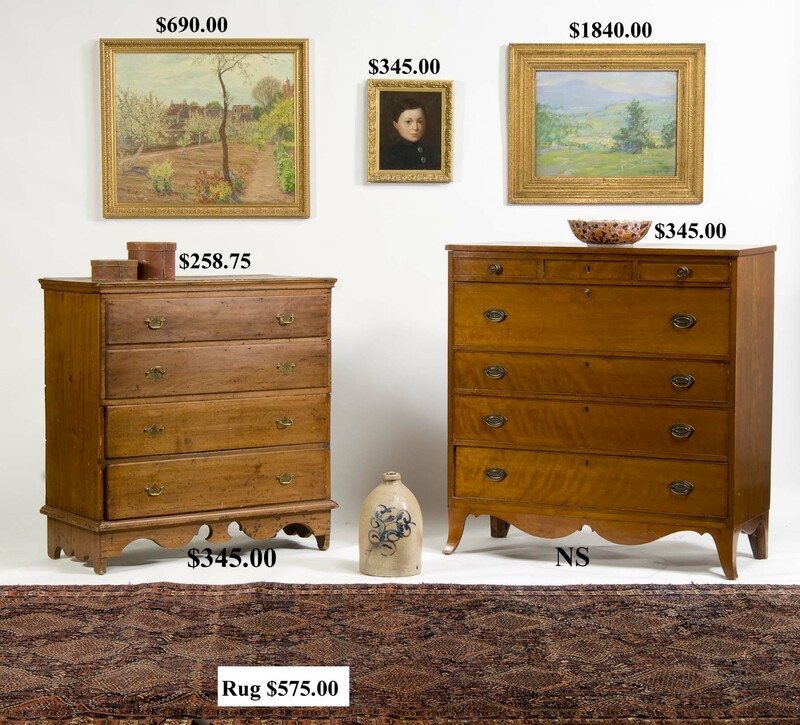 Large selection of 18th, 19th and 20thc. 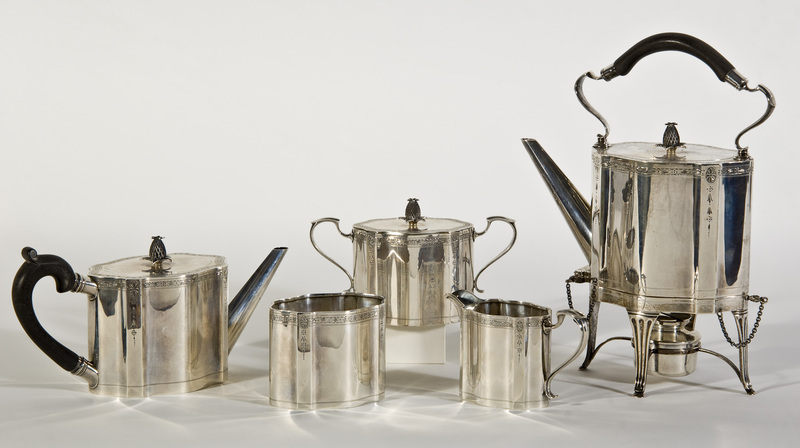 ESTATE SILVER hollow-ware, flatware, serving pieces and fine ladies’ and men’s accessories, including B. and J. Burt, Tiffany, Gorham, Harwood, Shreve’s, Caldwell and much more, all to be sold early in the sale. OLD DOLLS: 36 in. 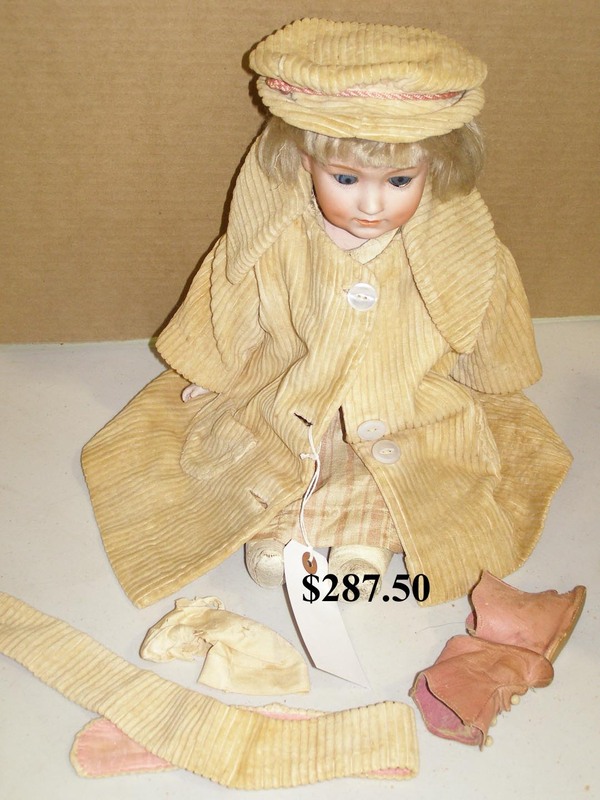 Simon & Halbig bisque head doll. Other S.&H. and Heubach dolls. A. Marseilles and other doll heads and parts. Older doll clothing. Fine 19th c. bird’s-eye maple doll bed. Dionne Quints in five seat wooden wagon. Private collection of twenty carved, turned and figural metal WALKING STICKS. 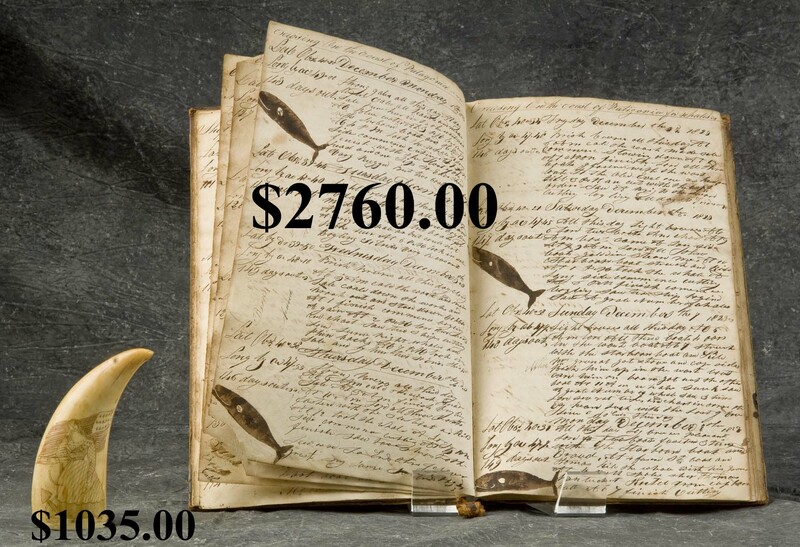 MARINE ANTIQUES: Graphic 1823-24 ship’s log, including travels of the New Bedford whaling ship Victory and the merchant vessel, New Galen. Antique scrimshaw whale’s tooth depicting sailing ship and maiden with Amer. flag en verso. 80 in. 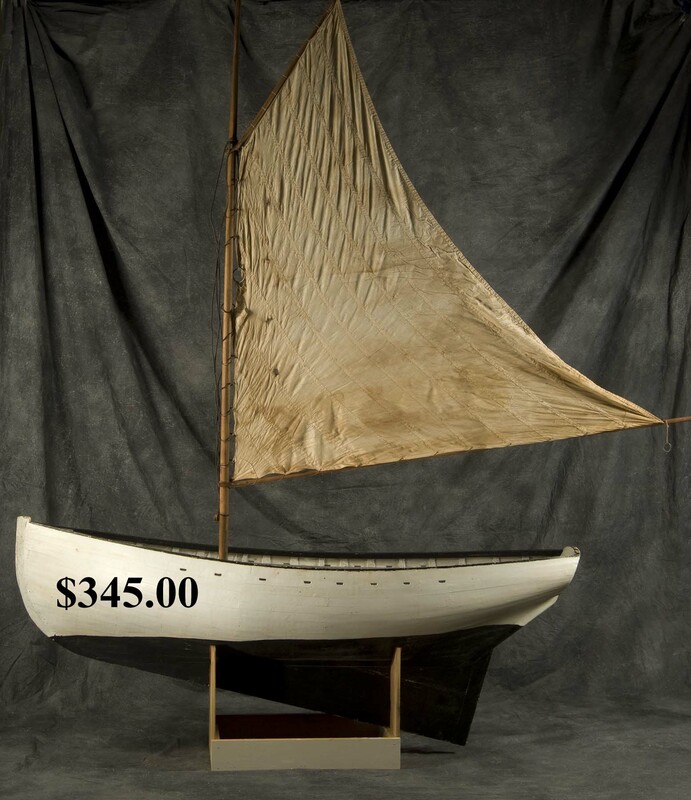 fishing boat model with sail built by noted c. 1910 Ogunquit, ME fisherman, Will Haley. 72 in. 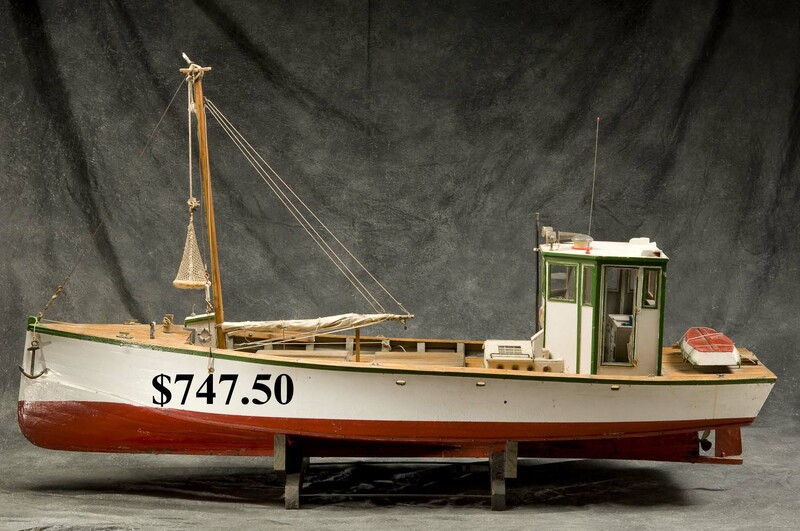 fishing trawler model built in the Faulkland Is. Other boat models. Iron bowsprit band (now a table) from the schooner Mary E. Olys, wrecked off Cape Porpoise in 1920. Marine-related books. Ship’s clocks, harpoons, lanterns, charts and misc. items. 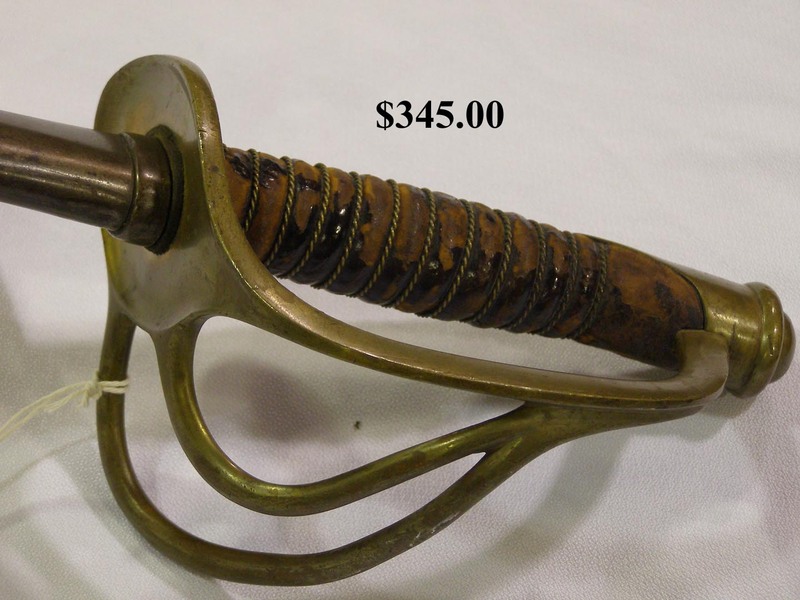 OLD GUNS AND MILITARY: 19th c. 45/70 musket. Manhattan F.A. 3-barrell pocket pistol. Stevens Pocket Rifle. C. Roby, Ames and other Civ. War swords (Lots: 448, 571, 572). W.L.G. stenciled tin shot flask. Leather Civ. War cartridge pouch, belt and buckle. Bayonets. 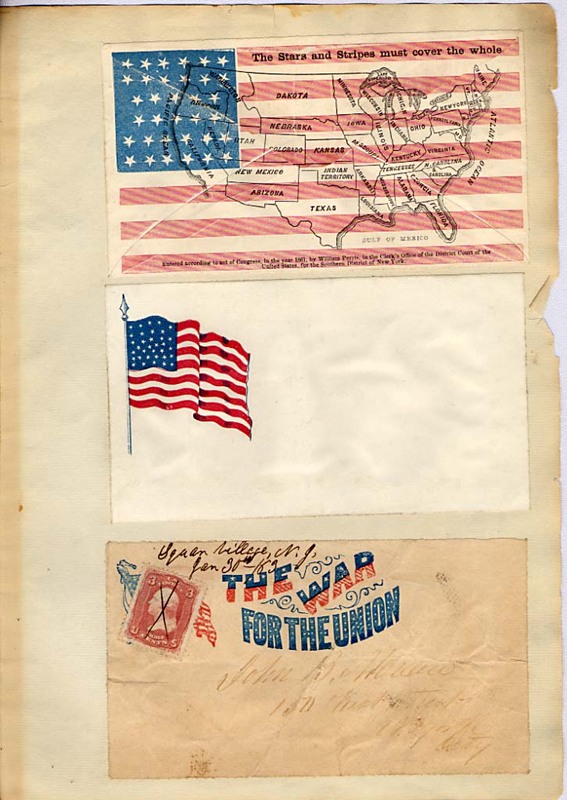 Single owner collection of principally pre-Civil War and CIVIL WAR BUCKLES, metallic cap and belt insignia. 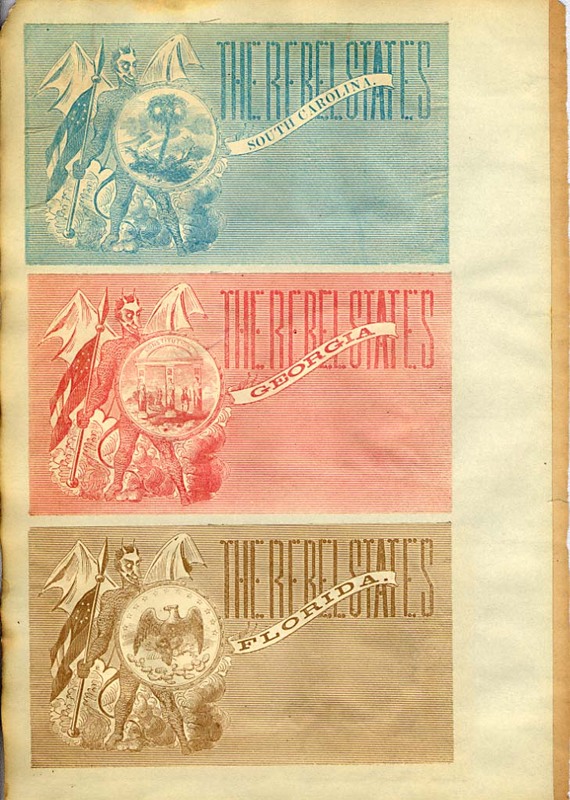 CIVIL WAR LETTERS: Collection of 86 letters written between Oct. 26, 1862 and June 8, 1865 by Sgt. 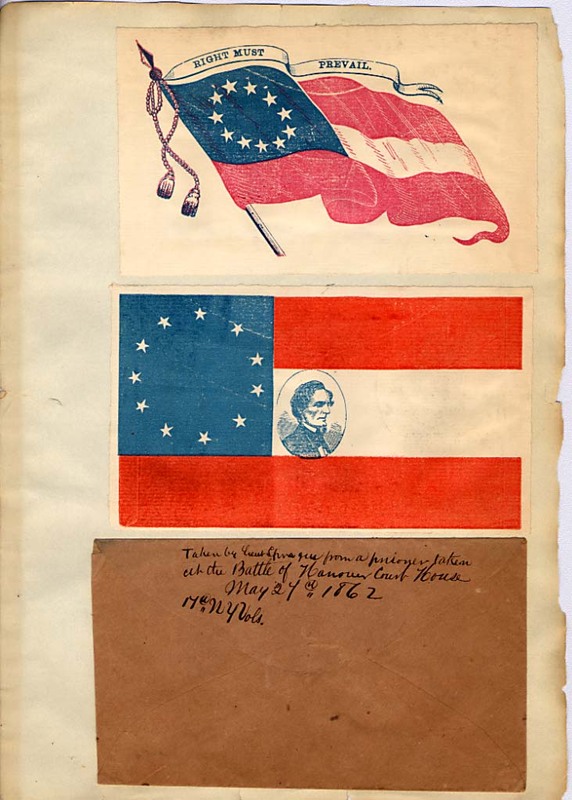 Stephen B. Tarlton, 13th NH Vols., to his wife, Arianna, in Hampton, NH describing battles and military life in graphic detail. Synopses of each letter accompany the lot and are available for preview. 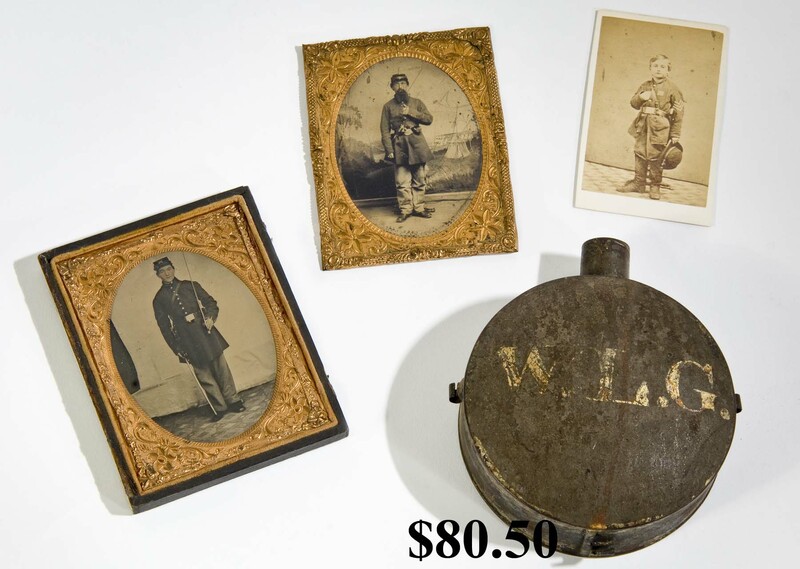 This sale lot includes photos of Tarlton and family members, military and Veterans Assn. ribbons, misc. paper and more. 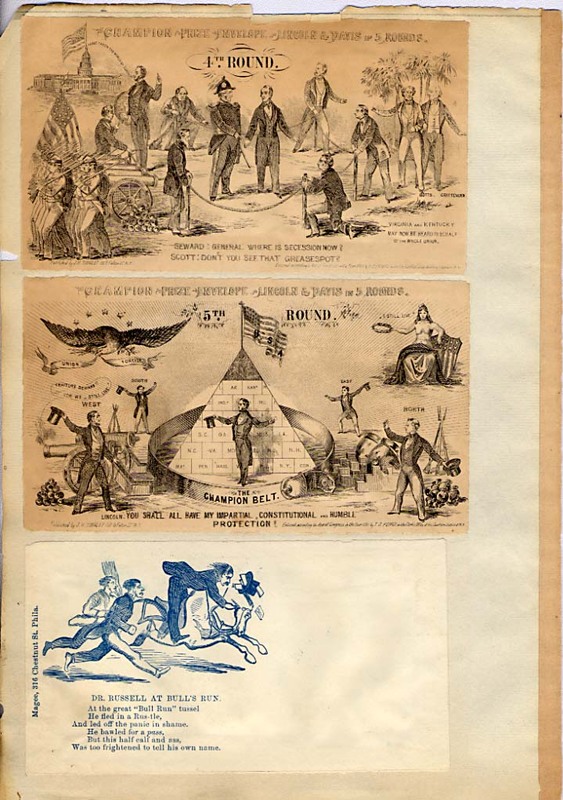 Another collection of 36 letters written between March, 1863 and June, 1865 by John Crandal of the 124th Reg., Ohio Infantry primarily to his wife, describing battles, troop movements, etc. 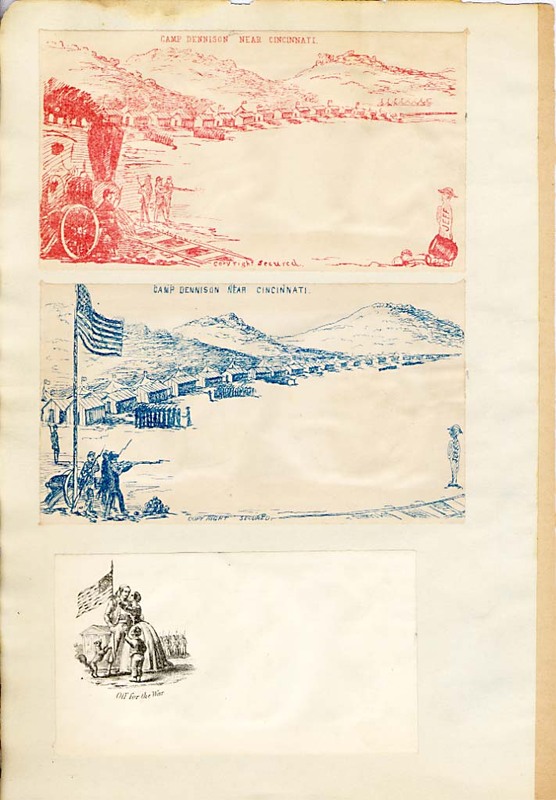 A third collection of approximately 40 letters written from the front lines by Pvt. Harvey Durkee of the 42nd Reg., Morgan’s Div., Army of the Mississippi. 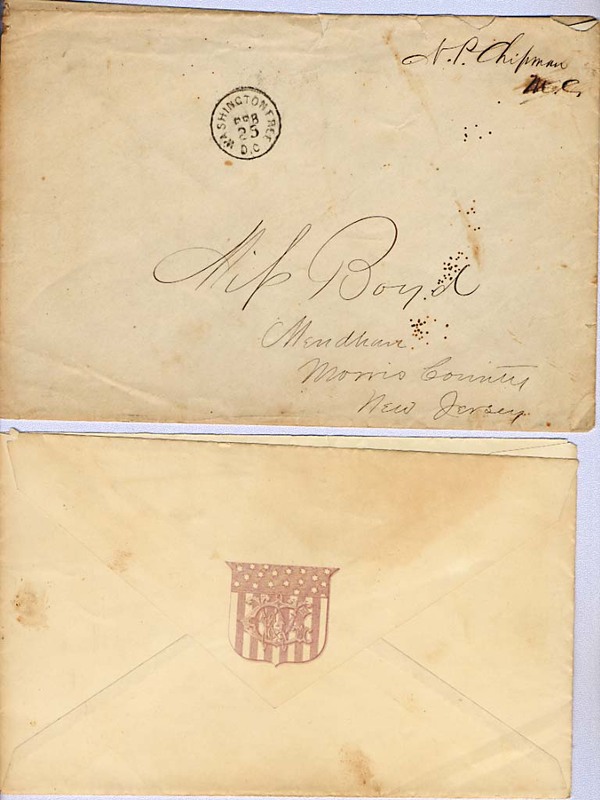 The Durkee letters are accompanied by a large collection of Durkee family letters written between 1848 and 1905 providing insights into who this soldier was and how his family was impacted by the Civil War. 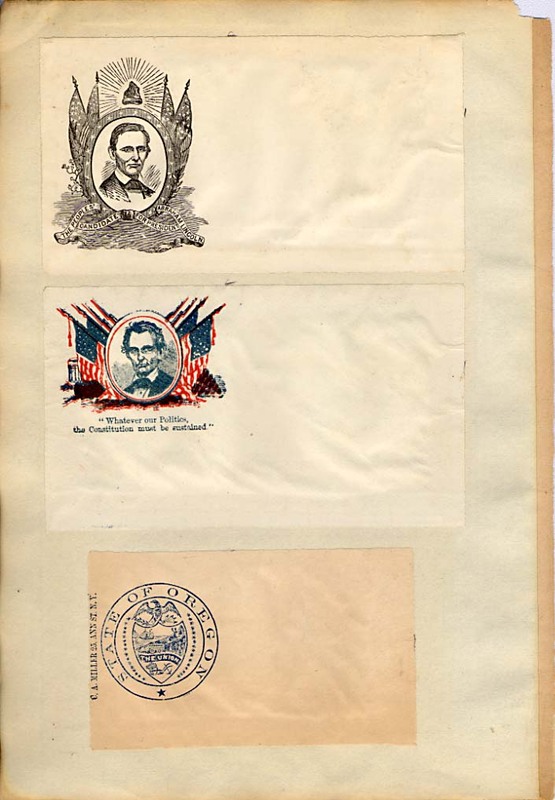 Both the Crandal and the Durkee letters have been transcribed and are available for preview. 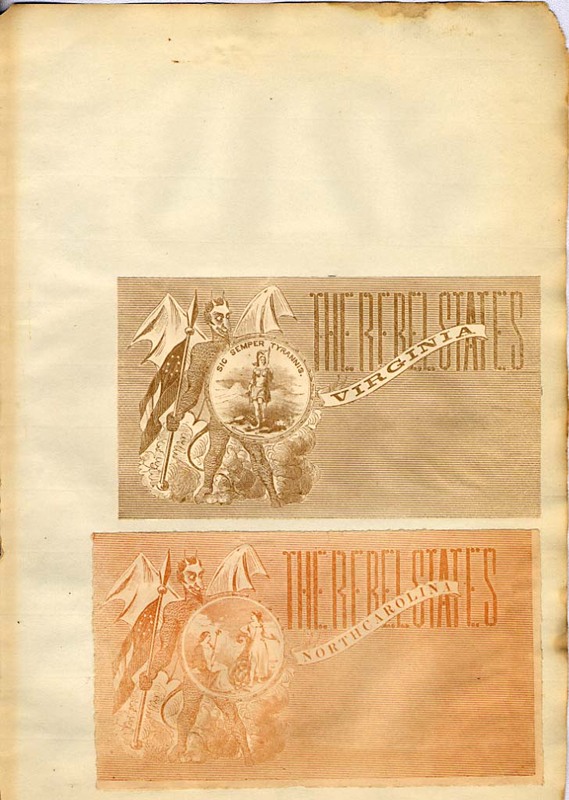 OLD PAPER AND PHOTOGRAPHY: ME State Militia broadside. 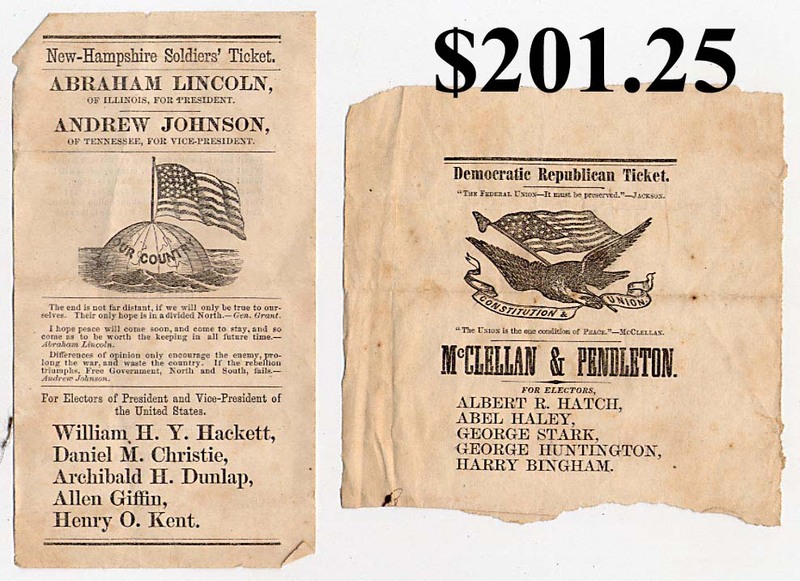 NH soldier’s ticket for Lincoln/Johnson, 1864. 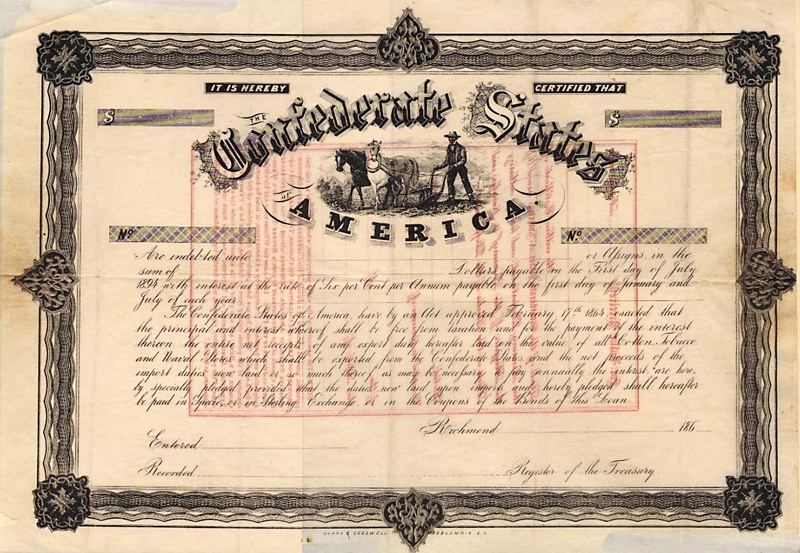 Blank Confederate induction certificate (back). Blank uncut sheet of ME Militia enrollment forms. 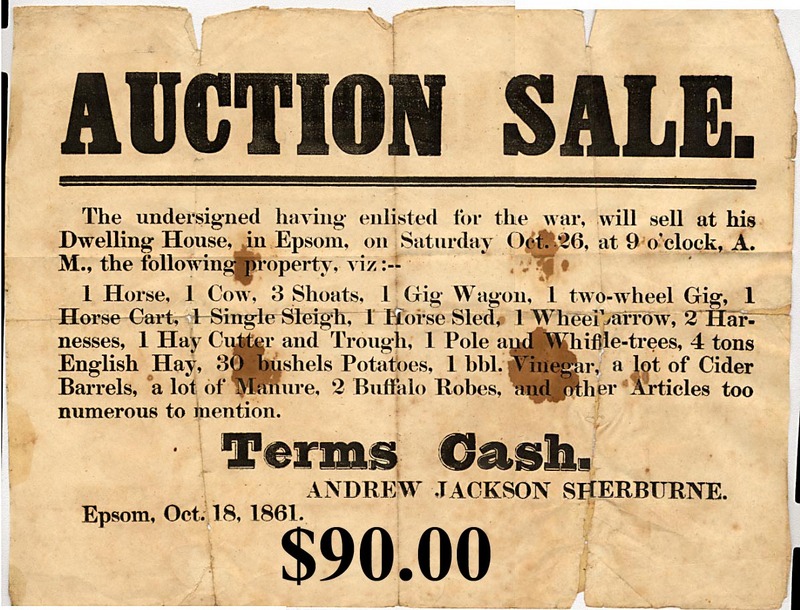 1861 Epsom, NH auction broadside to sell war inductee’s house and worldy goods. The rifle box, inscribed sword, documents and photos belonging to Gen. Wm. 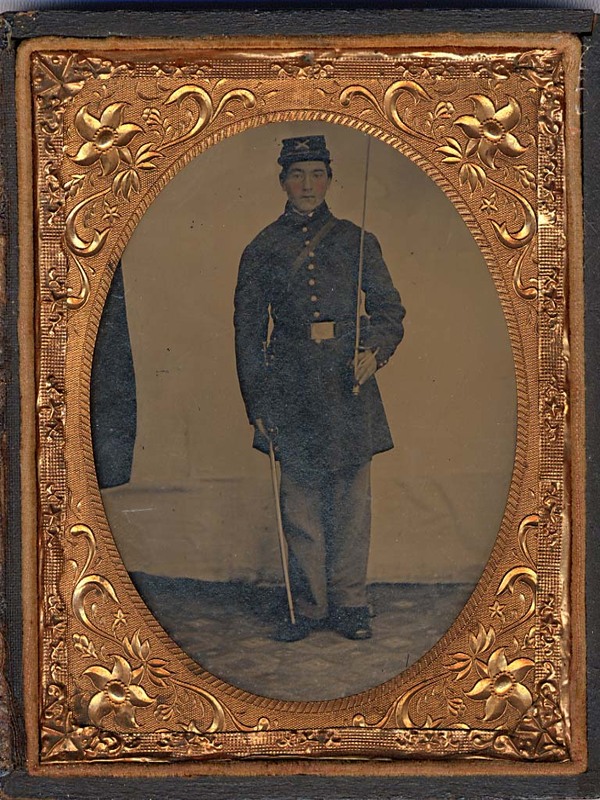 H. Brownell, Brooklyn, NY during his 1860’s and 1870’s military career. 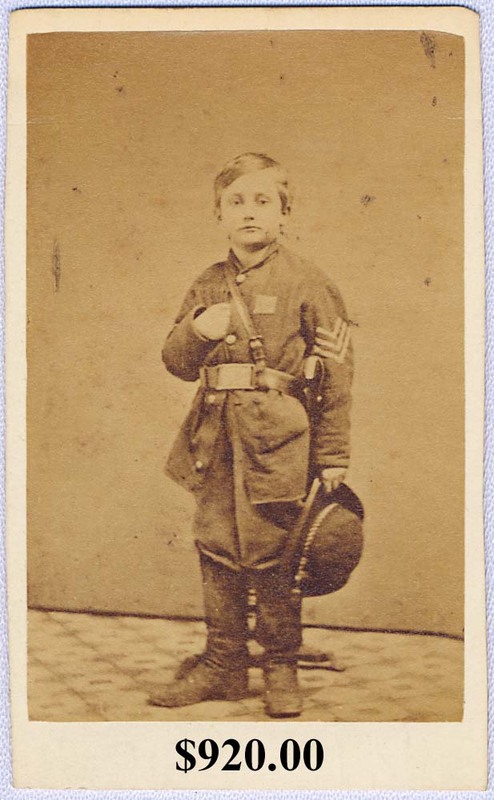 CDV of John Lincoln Clem (1851-1937) in Union drummer boy uniform and sidearm, later a general, the photo inscribed to Maj. Gen. Abner Doubleday, Civil War hero and founder of the game of baseball. 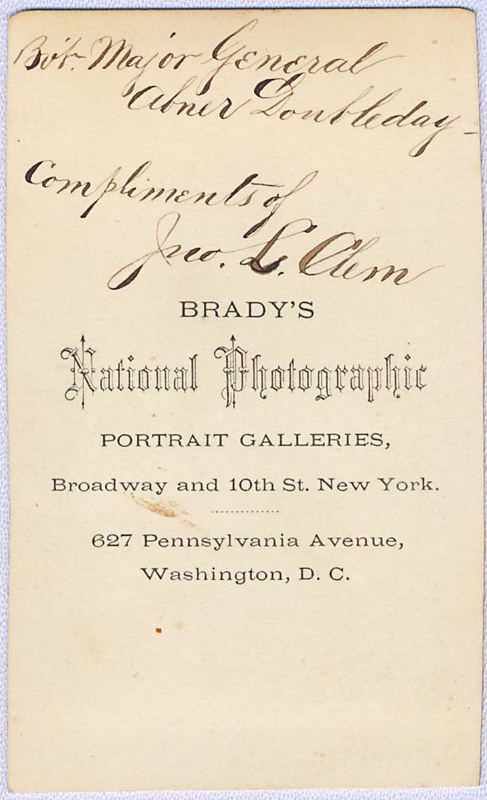 Large photo by W. H. Jackson, Denver CO. Misc. 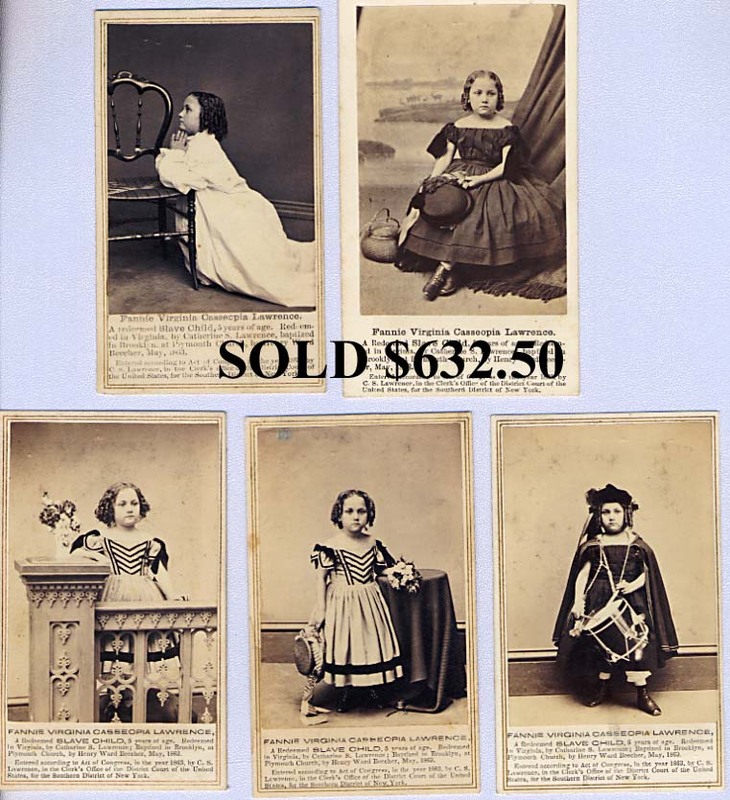 portrait daguerreotypes and photos. Sel. of stereo views, incl. Watkins of CA. 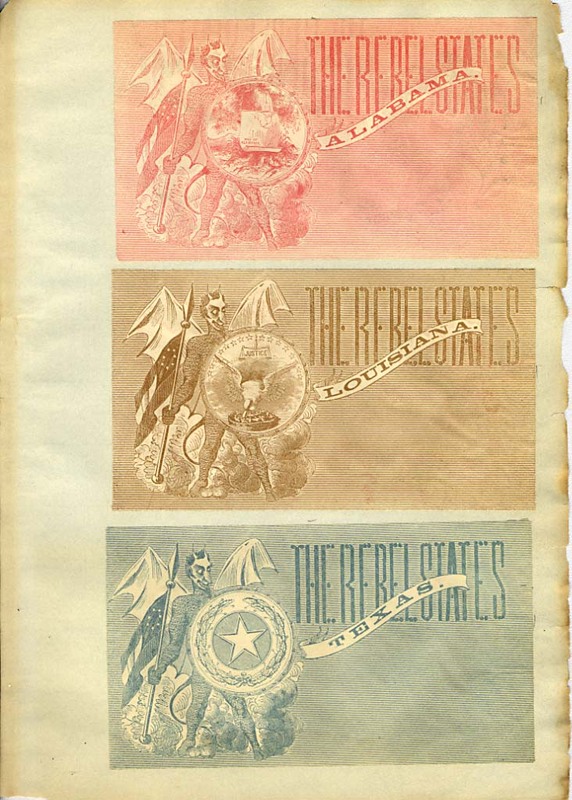 Colorful Civil War covers (1, 2, 3, 4, 5, 6, 7, 8, 9, 10, 11, 12, 13, 14, 15). 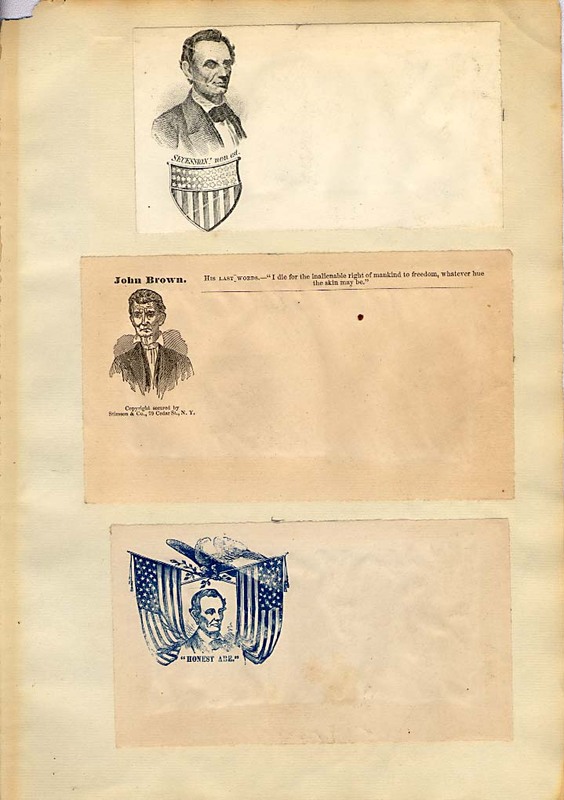 Selection of good soldier CDV’s and ambrotypes. 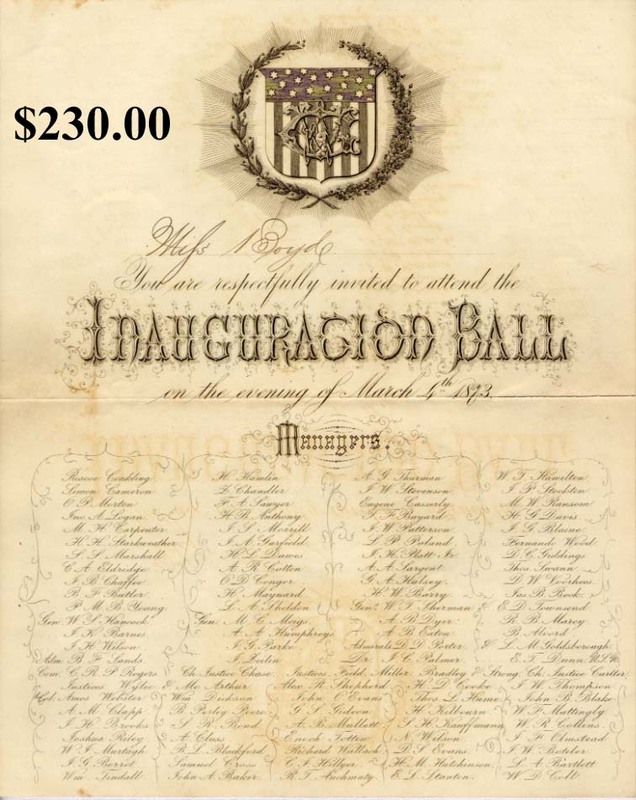 Invitation to U.S. Grant’s 1873 Inauguration Ball (env.) 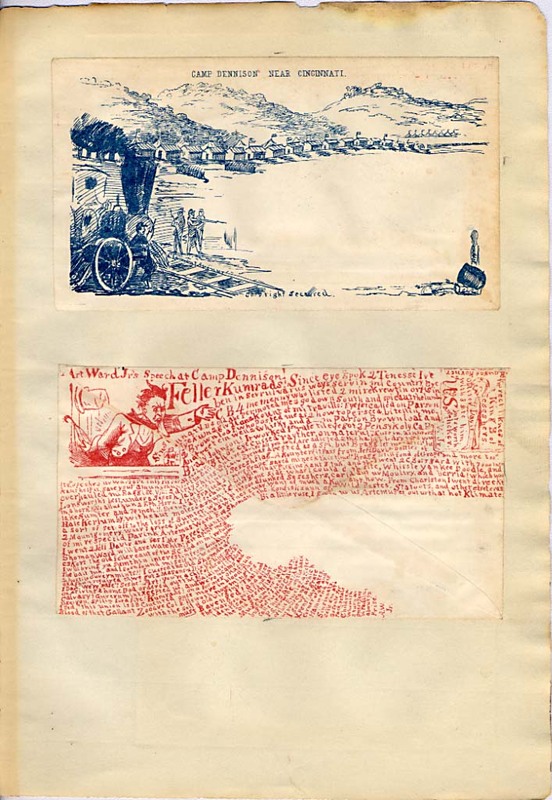 21 letters written by a tourist while in Paris in 1885. 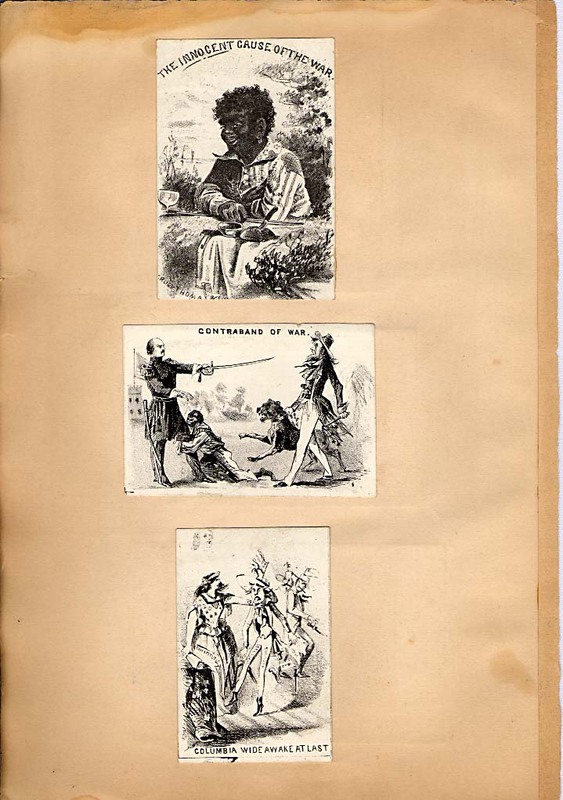 Six CDV’s of white slave children (backs). 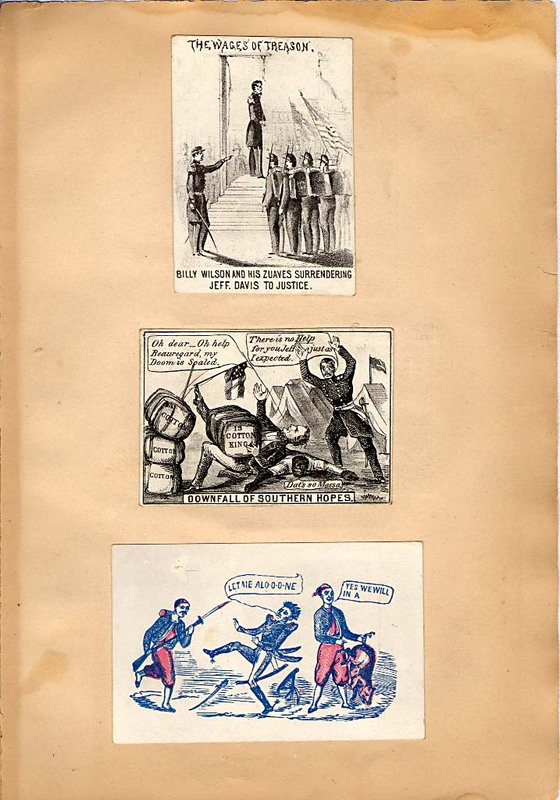 19th and 20th c. photo albums, incl. one with five C.W. soldiers and Lincoln. Scrap albums. 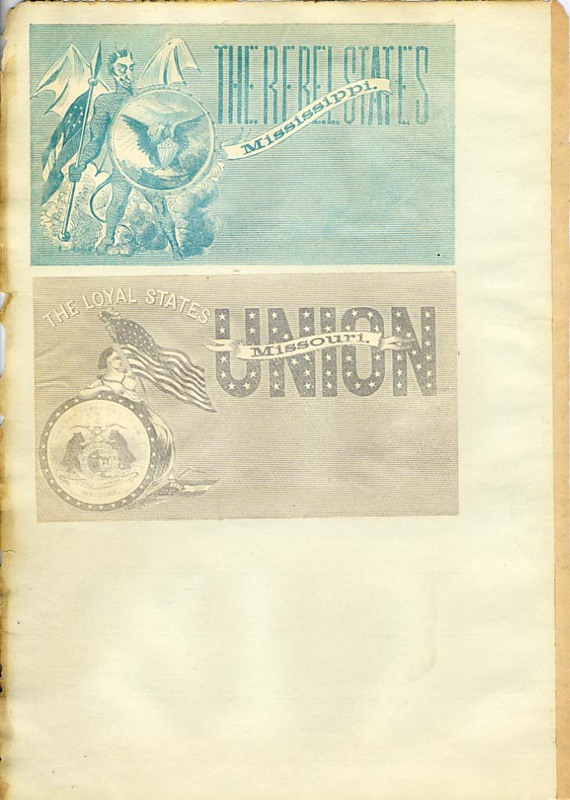 1961 Boston Birthday Dinner program for Pres. John F. Kennedy. 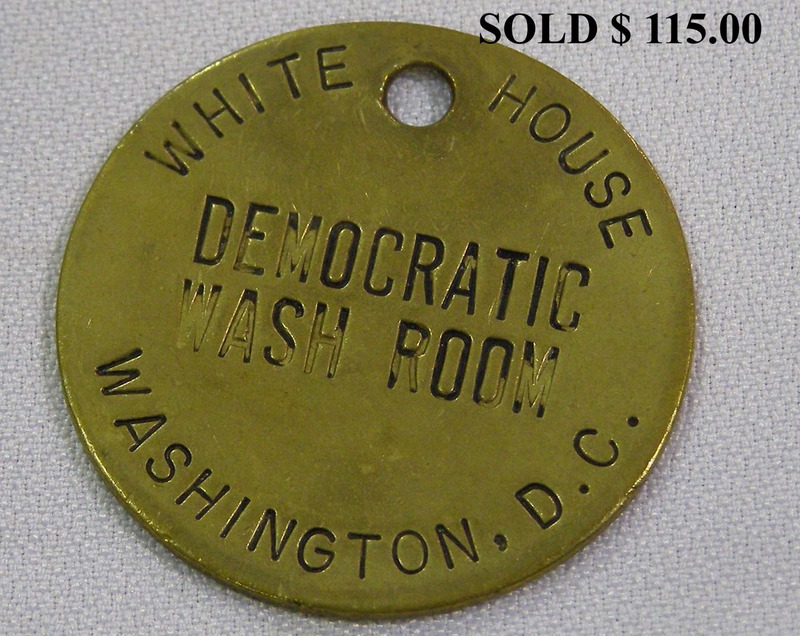 Thomas P. (Tip) O’Neill, Jr. ephemera, official jewelry, photos and rare White House Democratic Wash Room brass key tag, all having belonged to his secretary, Helen Harvey. Travel and theatre paper. Early Wentworth Hotel, Newcastle, NH promotional paper, postcards, photos and souvenirs. 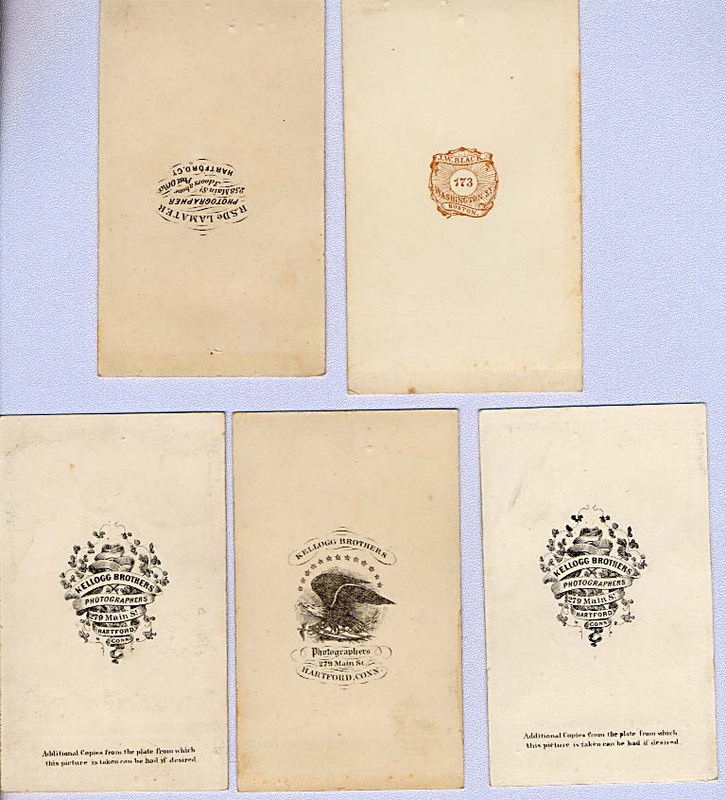 Photos and postcards relating to the Russo-Japanese Treaty signing, Portsmouth, NH. Frank Jones house plan. ESTATE BOOKS: 1861-62 bound Harper’s with fold-out maps and large illustrations. Hist. of C. B. & Q. RR. Vol. on Hotchkiss Revolving Cannon, illustrated with orig. mounted photos. Vol. I, Leslie’s Hist. of Civil War. 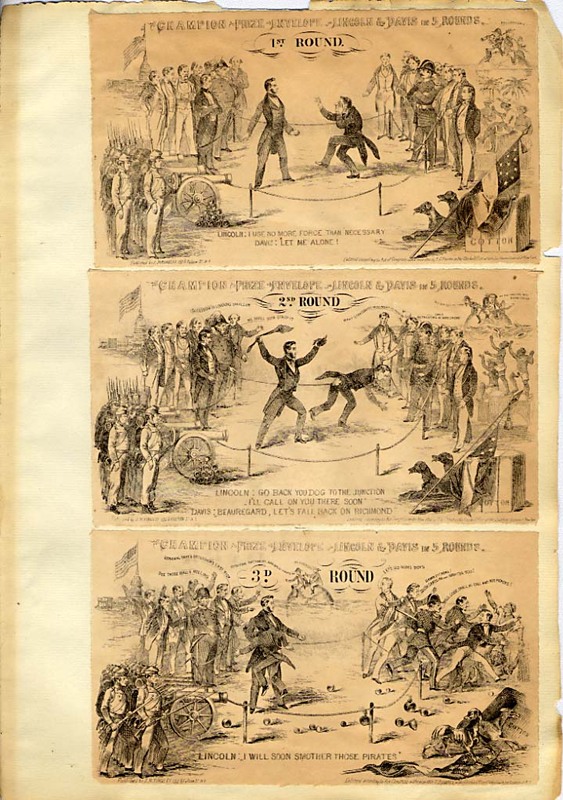 Long’s 1888 The Republican Party. Good early books on Portsmouth. Town and state histories. 18th c. large format leatherbounds. Much more. OLD PAINTINGS AND PRINTS: 25 X 30 W. S. Horton landscape o/c. Large H.E. Wicks Adirondacks pastel landscape. Large 19th c. o/c of early horseback battle scene. H.W. Phelps, 88, o/c of young girl. Striking 13 X 10 oil of boy in black. Small Chas. Warren Eaton landscape. 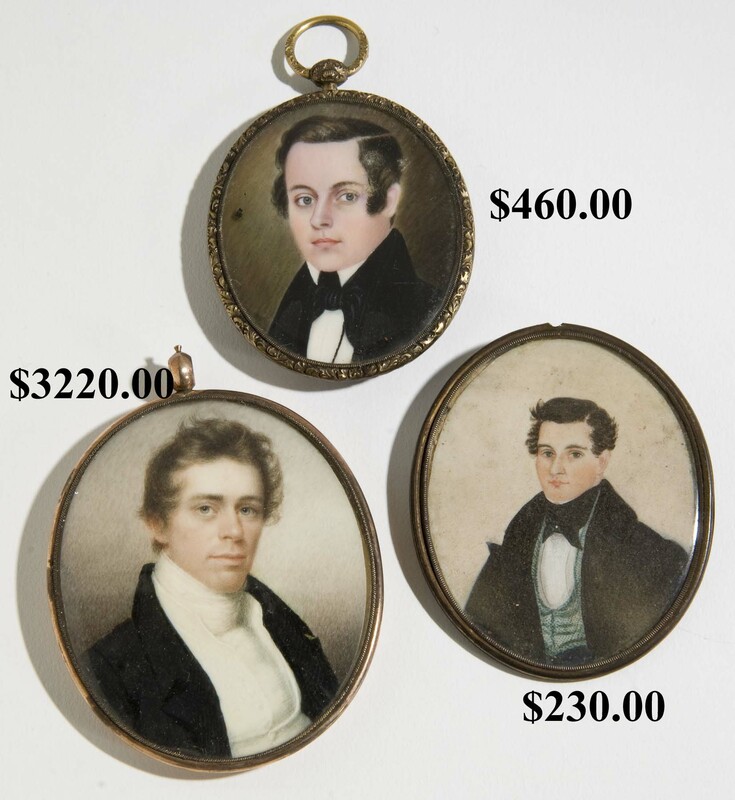 Good portrait miniatures. E. L. Harris coastal w/c. Copeland, 87, marsh w/c. Many decorative works. Many good 18th and 19th c. engravings, incl. Gimbrede’s Battle at Bunker’s Hill. ANTIQUE ACCESSORIES: Akagayak (?) signed Inuit carving of Eskimo with seal. Grenfell souvenirs. Good Mauchlinware. Old sewing items. Interesting old desk items. Mechanical “Organ Bank” (Book of Knowledge.). Keystone pressed steel dump truck (cab). Good doorstops. Windup musical birdcage. Boardman & Hart pewter. Louisville Slugger “Hank Gowdy” bat. Old baskets and woodenware. Hohner “Chromonika III”. Early andirons and fireplace access. 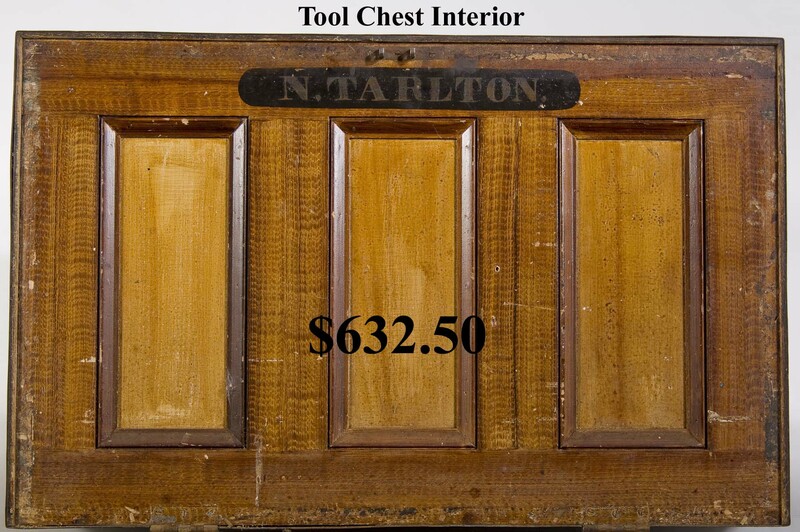 19th c. carpenters’ TOOL CHESTS with tools, including the chest full belonging to Nathaniel Tarlton of Hampton, NH. 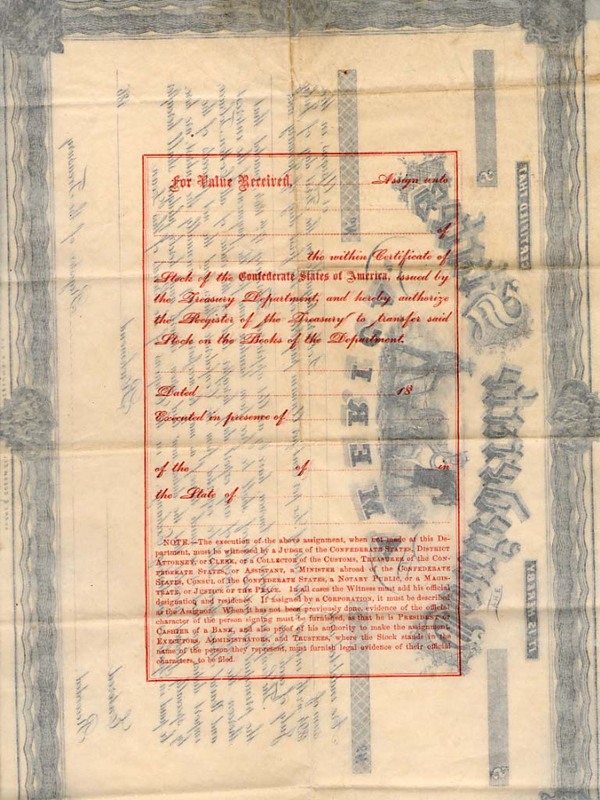 TERMS OF SALE: Cash or approved check. Mastercard and Visa accepted. 15% Buyer’s Premium. 5% ME Sales Tax applies to all purchases without copy of current resale exemption certificate. Written or oral descriptions subject to error or omission. 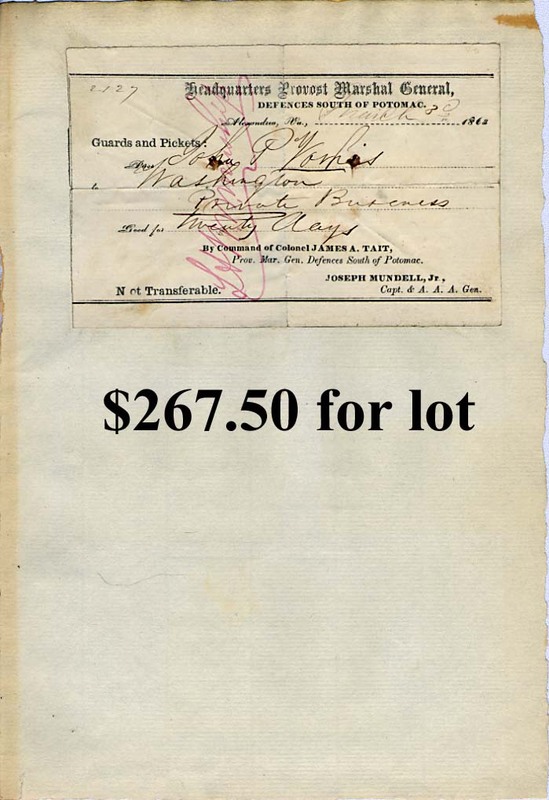 ** Absentee bids close at 9:30 a.m. on auction day. Sale catered by Through the Grapevine Caterers, Eliot, ME.